Do you ever need a comfortable work space or even just a desk when you’re away from your home or office? This may especially apply to freelancers and students who usually park their butts at a local cafe only to feel the pressure to buy more coffee to stay there or have to deal with crying babies, bums, or crazy people. But it can also be a fantastic option for those who have the freedom to work away from their office and gain productivity from being in a different environment! Well, now you have the option of Loosecubes! It’s an online “booking” site for work space offered by various companies around the world. And many of the spaces are available at no charge! That’s because, according to the site, these businesses benefit from “meeting relevant professionals on an ongoing basis”. You also provide reviews for the space which may eventually be rented out for a fee in the future. My buddy Jeanette, who is amazing at finding great deals in the city, was the one who told me about Loosecubes. As an actor and model with auditions throughout the day, she got to take advantage of using free office space between auditions to get work done! She has had positive experiences with the service. All you have to do is sign up on their site. There is currently a wait list, but as soon as a slot opens up, you get an invitation. Then you choose a location, and when the reservation gets approved, you arrive and meet your host who helps you get familiar with the place. How neat is that! And you choose what type of office you want, which gets you working alongside professionals who share the same interest. Can we say “networking”? 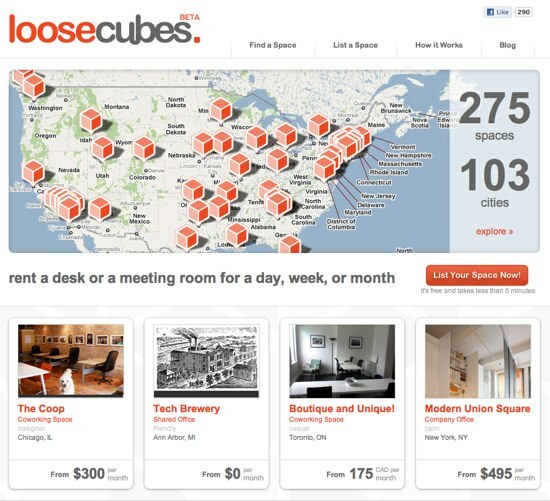 Check if Loosecubes spaces are available in your city here! Written by: Erica Cho on September 5, 2012.